A crowded beach for April? Must have been a very sunny day, but then perhaps people weren't the lily-livered pansies we all are today? Pavilion Garden. Shown is the lily pond, and there was a rustic bridge that went over the path into this garden, not surviving in this pic. The Pavilion, now a car park. Shown here after the fire. The right tower missing, and what looks like make-shift repairs. Chichester Road, original alignment, this part now known as "Babsham Lane". 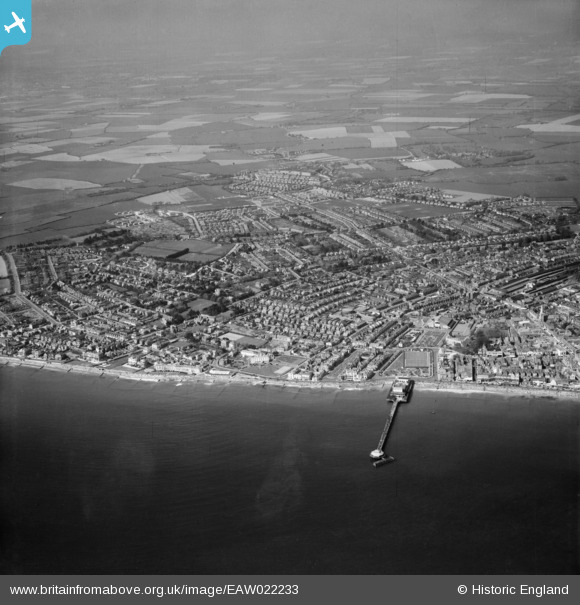 I would add that this is now the western boundary for urban Bognor Regis! Aldwick Road junction with Hawthorn Road, this is now a roundabout and the start of the "West Meads" housing development of the 1960s. Demolished to make way for a 1960s road, car park and access to new tower block development. This site is now a supermarket and multi-story car park (built late 1970s). The Bognor Bus station, this Art Deco building was demolished in the 1990s to make way for a supermarket car park. A tragedy, that was a building with Listed status written all over it.